Tamiya understands that military modellers seek variety in their projects and as many options as possible when creating dioramas. To that end, we have continued to add not only tanks, but also a wide range of support vehicles to our 1/48MM series. The latest addition is the versatile American 2.5 ton truck, which served in all theatres of WWII as well as in the Korea and Vietnam conflicts. Nicknamed the deuce and a half, the M35 2.5 ton 6X6 supply truck was one of the unsung heroes of WWII, with over 800,000 produced. Designed to be easy to maintain and repair, the truck served in all theatres supplying the front lines with needed material. One notable supply operation that the truck took part in was the Red Ball Express supply chain that was created after the Allied invasion of Normandy. It's rugged versatility meant that it was extremely configurable and troops in the field often added their own modifications according to their needs, like soldiers in Vietnam who welded armor plates to their trucks. 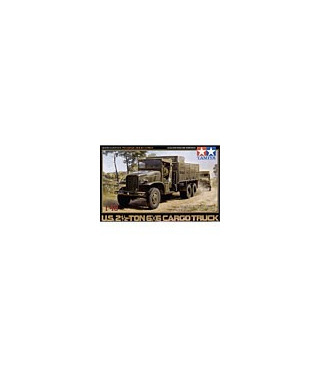 * High quality 1/48 scale assembly model kit of the American 2.5 ton truck. * Die cast chassis features metal screws for easy assembly with truck body. * Cabin top features realistic fabric texture and can be removeable to display cabin interior. * 1 driver figure included. * 2 types of markings, one from a unit in Normandy and another from the famous Red Ball Express are included.